I think we all have them. Recipes we make over and over again. Food we take to family events, pot lucks, picnics, you name it. We find our comfortable items and go with them. I have a few of them these days. They are mostly simple, but the flavors and the freshness of the ingredients are what makes them special. 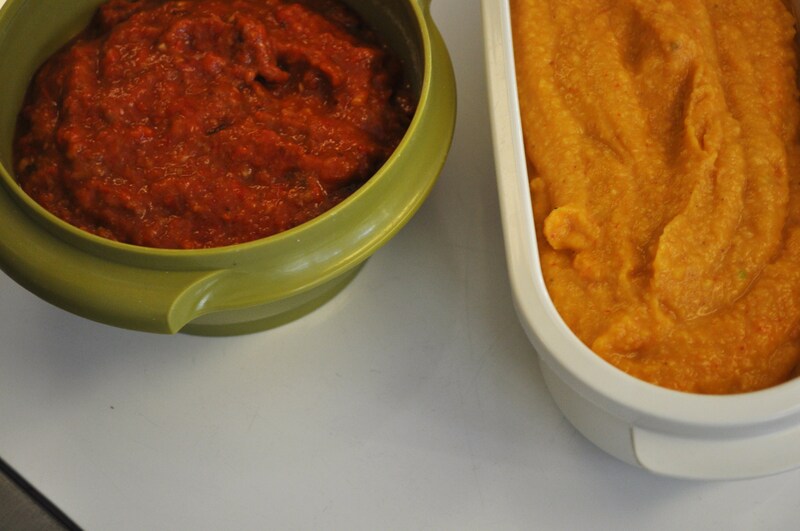 Like the pumpkin hummus and the ajvar. Two recipes I have used for months now. I called these noshing food. Learned to make them from browsing the local blogs. I just throw them together and off I go. The pumpkin hummus keeps evolving. I find all sorts of recipes to use as I make up my own concoction. They have not replaced my favorite spring and summer time staple. Pesto. 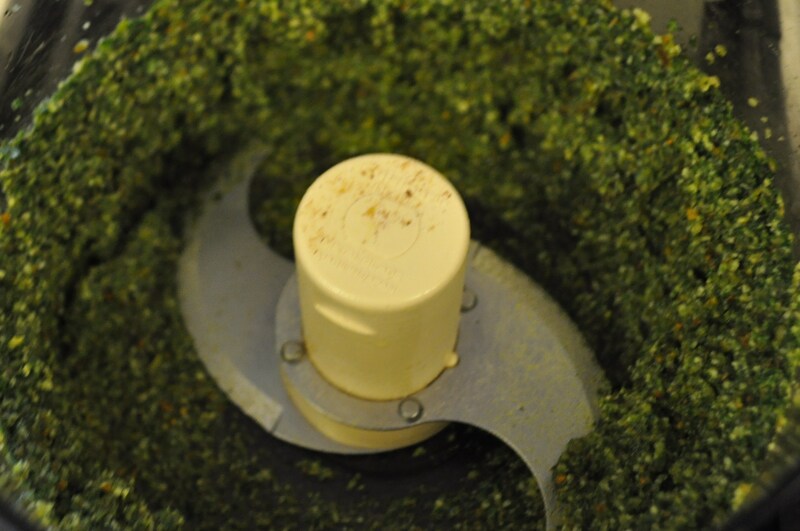 I have made pesto using the traditional basil, plus garlic scape, and a real stretch, carrot tops, radish greens, mint, basil, parsley, pistachios, pine nuts, parmesan and garlic. Olive oil drizzled in. Pesto on crostini is a perfect take to picnics choice. Other favorites include mozzarella with basil and olive oil. Sliced potatoes with goat cheese. Ina Garten’s herb roasted onions. I don’t know how many family picnics where I have had requests to bring the onions. 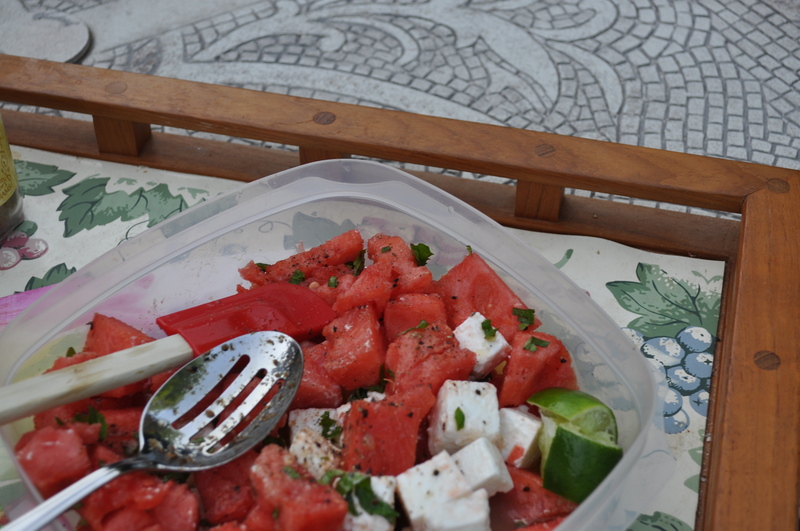 But for me, the watermelon, feta and mint salad is the number one requested recipe of mine. Simple, flavorful, almost deceptive when you look at it. Reminds you of tomato, mozzarella and basil if you chop it right. What are your “go to” recipes? What can you do from scratch without a cookbook? Something you have cooked for years. Seared into your brain, a signature dish. Posted in Food, Real Food and tagged cooking, foodie, real food. Bookmark the permalink. Go to recipes work wonders for potlucks, etc… Mine is slicing a loaf and stuffing it with blue cheese, olive oil and figs. Heat it and yum. It flies off the plate. Grilled salmon – marinate the salmon fillet in a mixture of soy sauce, bottled BBQ sauce & a couple shots of 5 spice powder. Marinate a couple hours then grill. Nothing local or organic about it, but with really fresh salmon it is very good.The 5 spice powder is what makes the marinade interesting.